When reading 2 Samuel 21:4-6, I can’t help but think about what’s been going on in our country for the last 3 years or so, concerning the killing of black people. I can call the role, but I won’t, because sadly it’s too long and I don’t want to forget anyone. But if you’ve been paying attention to the news of social media or the real news, you know the names of those killed, and unfortunately this is what happens; killer kills black person, killer doesn’t get charged, black people protest and create #hastags, killer gets charged, black people are satisfied, killer goes to trial, killer gets acquitted, black folk protest again and take to social media, victim’s family get awarded millions in civil suit. Now, I’m not saying this in a manner to by cynical or insensitive, but this is usually how it goes down in a nutshell. Right? “They answered, “Our quarrel with Saul and his family can’t be settled with silver or gold, nor do we want to kill any Israelite.” ……….“What, then, do you think I should do for you?” David asked. 5 They answered, “Saul wanted to destroy us and leave none of us alive anywhere in Israel. 6 So hand over seven of his male descendants, and we will hang them before the Lord at Gibeah, the hometown of Saul, the Lord’s chosen king.”………..“I will hand them over,” the king answered. Long story short, we can’t allow people to be killed for a price tag and those that do the killings need to be held accountable and brought to justice, by any means necessary! Malcolm X said that!! 12-14 I’m not saying that I have this all together, that I have it made. But I am well on my way, reaching out for Christ, who has so wondrously reached out for me. Friends, don’t get me wrong: By no means do I count myself an expert in all of this, but I’ve got my eye on the goal, my eyes are on the prize, where God is beckoning us onward—to Jesus. I’m off and running, and I’m not turning back. 15-16 So let’s keep focused on that goal, those of us who want everything God has for us. If any of you have something else in mind, something less than total commitment, God will clear your blurred vision—you’ll see it yet! Now that we’re on the right track, let’s stay on it. 17 Stick with me, friends. Keep track of those you see running this same course, headed for this same goal. Propositional Statement: In order to attain any meaningful goal in life you have to be willing to work for it, no matter what it takes and don’t bail out. Antithesis: It is my belief that everyone in this church has a special God given talent. Every man, woman, boy, and girl in here is talented at something whether they know it or not. Thesis: But what the text is telling us is that when we have a goal to reach in life, we cannot quit on our goals. Relevant Question: Why can’t we bail out? Synthesis: We can’t quit because we’ve already started on our way, if we already started, we have finish what we start. Have you ever thought about purpose? Every year a new book is released to help people achieve their purpose. Purpose Driven Life, The Power of Purpose, Your Best Life Now, 10 Steps to Purpose, 7 Steps to Your Dream; everyone has got the answer! TD Jakes said it like this, “If you can’t figure out your purpose, figure out your passion. For your passion will lead you right into your purpose.” Ralph Waldo Emerson said, “The purpose of life is not to be happy. It is to be useful, to be honorable, to be compassionate, to have it make some difference that you have lived and lived well.” ….So, I ask again, have you ever thought about purpose? Well, let me ask that a different way, what is your purpose? I don’t know about you, but I don’t believe God wants us to go through life, just to be going through life. I don’t believe in doing stuff just to be doing stuff. I don’t believe in taking up space, just to be taking up space. If we’re going to be here on this earth, we need to be here for a purpose. Purpose, is what the Japanese people call, “IKIGAI,” meaning reason to get up in the morning!” In other words, purpose is our reason to live! Do you know your reason to live? I know that some of us work jobs, but what is your reason to live? I know some of us are retired or close to retirement, but even in retirement, what is your reason to live? I know you been coming to church Sunday after Sunday, Wednesday after Wednesday, but what is your reason to live? Why are you here? Why are you still here, living in 2015? You weren’t born in the biblical days, you weren’t born in medieval times, you weren’t born during slavery, but instead God intentionally chose you to be born in the 20th and 21st century for a such a time as this; so I ask you once again, what is your IKIGAI? Why do you get up and go? Is it for your children? For your grandchildren? For your family? For your church? For money? To prove somebody wrong? For your own Ego? For a purpose? For God? Why are you here? On the flip side, while all of us are called to purpose, many of us fall into three categories– either we know our purpose and are living it out; we don’t know our purpose at all, or we know our purpose and the vicissitudes of life get in our way. I’ve found out, that life will put hurdles, obstacles, mountains, roadblocks, detours, impediments, and barriers in our way. In life, haters, jobs, bills, personal issues, hang-ups, hurt and pain, politics, the unknown and unexpected all get in our way to throw us off course. The reality is, as a result of these roadblocks, hard times, and mess– some of us usually think about giving up, before we ever reach our goals and fulfill our purpose. Life happens and we think about giving up! God is calling us to be great men and women of God, but for some of us, the hurdles have become too high, the mountains too mighty, the detours too dangerous, and the hurt too heavy. If we’re going to be honest this morning, from time to time there are times when quitting is the better option. We may think about quitting our job, our marriage, our friendships, quitting on our dreams, our program, our family, or even quitting on God! Sometimes in life, QUITTING just seems like the best thing to do. Do I have a witness in here? Are there any folk in here who can be honest and admit they thought about quitting? Thought about giving up! Thought about filing for divorce. Thought about walking away and leaving the church! Thought about turning in your resignation letter! Thought about packing your bags! Thought about throwing in the towel! You don’t have to give yourself away, just wave your big toe at me. Newsflash, If you’ve ever thought about quitting, you’re not the only one, many before you have and many after you will! The Good News is, there is hope found in this 2,000 year old scripture, for all of us……. who have ever felt like giving up! Ebenezer, as we dive into our text this morning, the Apostle Paul gives us The Good News and my thesis, which is, “Just Keep on Running, Keep Running, and Keep Running.” My brothers and sisters, In our text, we find Paul writing a letter from Prison to warn the church at Philippi, about outside distractors trying their best to hinder the Philippians church from being the faithful Christians that God has called them to be. These haters that were trying to distract and discourage the Philippians were called Judaizers. Church, the Judaizers were a fundamentalists group of people who tried to do everything by the book of the law. They taught and preached that being a true Christian, meant following all the literal laws in the Bible, dotting every “I– crossing every T,” being circumcised, keeping strict dietary rules, and being religious in their lifestyle. The Judaizers thought God would only accept them if they walked like a Jew, talked like a Jew, lived like a Jew, ate like Jews, wore their hair like the Jews, and acted more Jew than the Jewish people. And can I tell you, just like Paul told the Philippians Church, God doesn’t care how religious we are, if we have no relationship with him. God doesn’t care how much we know about being and acting Christian, if its not done with a sincere and loving heart! The Judaizers thought they knew how to be Christ-like , but had no idea. Paul told the people, if anyone has a reason to brag about how good they are, I do. Paul said, I was born a Jewish man, circumcised on the eighth day, born in the elite family of Benjamin, went to the best Jewish schools, read the Torah, kept all the laws, even persecuted Christians with great passion. But none of that matters anymore. Because Paul says, none of that compares to knowing Jesus Christ. Paul loved the fact that he was now saved, fire baptized, and filled with the Holy Ghost. Paul had a new lease on life and turned over a new leaf. Paul was now a good and faithful Christian and he had a desire to know Jesus Christ even deeper! Paul was hungry for a more intimate relationship with Jesus Christ! That was his goal! Paul wanted to know Jesus so deep that he said in verse 10, “I want to know him in the power of his resurrection, and the fellowship of his sufferings, being made conformed unto his death.” Paul finally found his purpose to run for in life! Which was to live like Christ! In other words, Paul had one goal in life; to live for, suffer for, and die for his Lord and Savior Jesus Christ. No matter what Paul encountered, how hard it got, whether he was in jail, dealing with haters, Paul was determined to Keep Running towards his goal! Paul strapped on his running shoes and he ran to be more like Jesus! Paul was writing to encourage the church at Philippi to stay faithful, don’t get discouraged, and keep running towards your goals and purpose! And on my 16th Sunday as pastor of this great church, I believe God sent me by Ebenezer African Methodist Episcopal Church to tell y’all… whatever your goals and purpose are, stay faithful, don’t get discouraged, don’t quit, don’t get weary in well doing, work together, ignore the naysayers, love God, love others, love yourselves, and keep on running, running towards your goals! The question is, WHY SHOULD WE KEEP ON RUNNING? We should Keep Running because We have to Finish what We Start. Look at the text, Paul says in verse 12, “I’m not saying this because I have it all together, because I’ve made it, but I’m well on my way.”……… Paul suggests to us, that he’s already on his way towards his purpose, which is being more like Christ! So, in his mind, If I’m on my way, why stop now? Sometimes for us, the hardest thing to do in life, is get started towards our purpose and goals. We like to procrastinate, think about it five and six times, pray about it, research it, pray about it, ask our friends about it, pray about it again, fast, change our minds, but after all the deliberating, we never get started. Church, don’t think about, be like Nike and Just Do It! Get Started! In this text, God is using Paul to tell us, its time to finish what you start! Perhaps someone in here today, has already started school, wrote the business plan, started the diet, began the program, applied for the job, bought the ring, began writing the book, and started towards your goals, now is the time to finish what you start! I don’t know who I’m talking to, but you can keep running, because you have what it takes! Your smart enough! Gifted enough! Talented enough! Strong enough! Know enough people, have the support, and God is with you! So finish what you start! Right Here at Ebenezer amazing things have happened over the past quarter! Lives have been touched, hearts have been changed, money raised, souls saved, van paid off, the community is being reached, awesome Vacation Bible School, wonderful Homecoming services, and the best is yet to come!! In the future, there is a church and parsonage to be renovated, lives to be saved, land to be built on, county to transform, and Norfolk-Eastern Shore District to lead, so we must finish what we start! Listen to what God is saying, since you’ve already started on your way, don’t turn back now! KEEP RUNNING! When you feel like giving up, let this word be a reminder to keep pushing towards the mark, pressing towards the mark, fighting towards the mark, praying towards the mark, straining towards the mark, like a sprinter in a race, leaning towards the mark, because we’re almost there. The Goal is in reach! The finish line is near…… NOW, Finish What YOU start! Why should we Keep Running? Because in verse 14, Paul says, “I am well on my way, reaching out for Christ, who has reached out for me. Friends, don’t get me wrong: By no means do I count myself an expert in all of this, but I’ve got my eye on the goal, my eyes are on the prize, where God is beckoning us onward—to Jesus. I’m off and running, and I’m not turning back” Momma, we can’t quit, because Running Gets us Closer to our Prize! Understand this, In this pericope of scripture, Paul’s purpose, represents his prize! His goal represents the prize! His destiny is the prize! So for us, the prize is what God wants us to have! God is calling us to the prize, because God wants us to walk in our purpose and destiny! No one, but God gives us purpose and destiny! We need Jesus to show us the way to achieve purpose and destiny and the Holy Spirit to empower towards purpose and destiny! The closer we get to Christ, the closer we get to our purposed prize. The more we run towards Jesus, the closer we get to our destined prize! In other words, our Prize and the Prince of Peace are connected!. Paul’s goal was to reach Jesus, which should ultimately be our eternal purpose, but God has also called us to an earthly purpose. God has called us to reach a goal for his glory! (pause) ……..Let’s be honest, You know what you want in life! You know your hearts desire! You know the dream that keeps you up at night! In case you didn’t know Jesus wants you to achieve that PRIZED purpose! So let me say it again, the closer we get to Jesus, the closer we can get to our purpose in life. The text says in verse 14, that God is beckoning us onward towards Jesus. To beckon is to signal or entice someone to something by gestures such as waving, nodding, jumping, or doing whatever it takes to get that person from where THEY are, to come to where YOU are. Alright, you not feeling me; let me make this clearer, how many of us have ever seen a relay race in the Olympics? I love watching the relay races, especially the 4X100 relay race! In a relay race, each race is designated for a certain distance and the team who gets to finish line first– earns the ultimate prize. If you pay close attention, whenever its time to pass the baton, the runner on the receiving end is always beckoning the incoming sprinter to their location on the track. However, what always intrigues me, is the exchange of the baton between the 3rd sprinter and the anchor sprinter. Rev. Smaugh, The anchor sprinter is always the last sprinter. Anyone who knows anything about track, knows that you always put your fastest, strongest, most confident, and most capable runner in the anchor position. 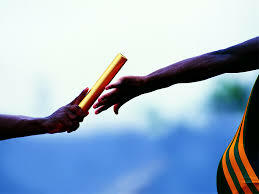 On the last leg, the incoming runner has to reach his/her hand and put the baton into the hands of the outgoing runner. It’s the anchors job to carry the baton to the finish line! Pass the baton to a sprinter he trusts is faster, a sprinter that is stronger, a sprinter that is better, and a sprinter that is more capable of finishing the race and bringing home the Gold, which is the ultimate prize. And in case you need some help this morning, in this race called life, WE are the 3rd sprinter and JESUS is our ANCHOR!!!! I’m talking about Jesus, he is the GREAT sprinter. He will help us run this race! Just pass your baton and put your ALL in his hands! Reach out and put our purpose in his hands, reach out and put your pain in his hands, reach out and put our addictions in his hands, reach out and put our problems in his hands, reach out and put our lives in his hands, reach out and put our hopes in his hands, reach out and put our families in his hands, reach out and put our destiny in his hands– because if we KEEP RUNNING and REACH OUT to JESUS, HE will carry us to the prize! Put it all in his hands! His hands can handle it ALL! I know he can handle it because, Jesus is bigger, Jesus is faster, Jesus is stronger, Jesus is wiser, and Jesus is better for the job! I hear Jesus saying, come on (waving motion) man of God, come on king, come on mighty man of valor, come on Queen, come on virtuous woman, come on Child of God, just keep running to me! Jesus is saying, just a little more commitment, more giving, more praying, more trust, more hope, more faith, more effort(waving) come on, I’m here with you, just keep your eyes on the prize! Don’t look at the bills, don’t look at the storms of life, don’t listen to the busy-bodies, don’t listen to the haters, don’t be discouraged, fight through the temptations, ignore the nay-sayers! Keep pressing! Keep reaching! Keep running! And when times get tough and life gets hard! When you feel like giving up and you have no strength to run on…..KEEP RUNNING, Keep running, keep running towards Jesus, because RUNNING will get US CLOSER to OUR PRIZE! WHY SHOULD WE KEEP ON RUNNING? We should KEEP RUNNING, because We’re not running by Ourselves! Look at what Paul told the believers of Philippi in verse 17, “Stick with me, friends. Keep track of those you see running this same course, headed for this same goal.” Family, this journey called life is too hard and too difficult to be on it alone. Just like the song says, “I need you to survive, you need me, we’re all of apart of God’s body, stand with me, agree with me, we’re all apart of God’s body.” It is so crucial in life to surround ourselves with like- minded individuals who are headed in the same direction as we are. There will be times when we want to quit, but those people won’t let us quit, because they know the magnitude of our prize. We should surround ourselves with people who have more experience than we do, because they can tell us where to turn, which obstacles to avoid, and which roads not to take. We want to be around folk, like the four friends in the Gospels who carried their sick friend through a roof to see Jesus! We want to surround ourselves with folk who ain’t afraid to speak life into our spirit! We need to be around folk who ain’t afraid to walk with us into our destiny! Lastly, as I take my seat, we can Keep Running,if we do what my momma always told me to do! PREACHA, what did your momma tell you to do, always take your daily vitamins. I’m talking about vitamin A, B, C, and so on! Does anyone in here know about vitamins? Ebenezer, we can Keep Running, if we take our vitamins. 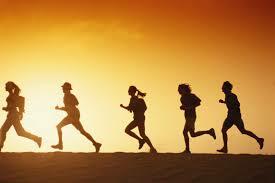 Take them, everyday!……..
And after you take your vitamins, get back up and KEEP RUNNING!!! So RUN ON my brother, RUN ON my sister…. Do I have anyone here today, who’s ready to run on? We need KEEP RUNNING, B/C We’ve Already Started, It Gets Us Closer to Our Prize, and We’re Not Running By Ourselves! Acts 27:9-26 Keep the Main Thing, the Main Thing!! Too often in life, we place unnecessary and misplaced value on temporary possessions such as, clothes, cars, houses, family heirlooms, and money$$$$. The reality is, at any moment in our lives, we could lose the “things” we values to theft, fire, natural disaster, and misplacement. ANYTHING could happen against our will and then their gone forever!! As a pastor, I’ve officiated and attended many funeral, but I’ve never seen the deceased be buried with their personal possessions! NEVER!!! In this scripture, the Apostle Paul is being transported as a prisoner, on his way to Rome. Unfortunately, along the journey to Rome, they encounter a bad storm. Paul warns the Roman Soldier on board, that continuing into the storm, will eventually cause the ship to be destroyed, cargo lost, and loss of lives. They ignore Paul! However, one night on the ship, Paul has a dream and is told by an angel that, the ship and cargo will be lost, but lives will be saved!! Whats the takeaway?? I?n life, it’s crucial that we practice Keeping the Main Thing, the Main Thing!! That’s PEOPLE!! Everything was lost in this story, except for the lives of the people! Remember, in life, people always come before things! Dear Lord, remind us to people first and to use our temporary possessions to build your kingdom on earth! A Dream Come True….but I’m TIRED!! Is Your Presence Turned On? ?